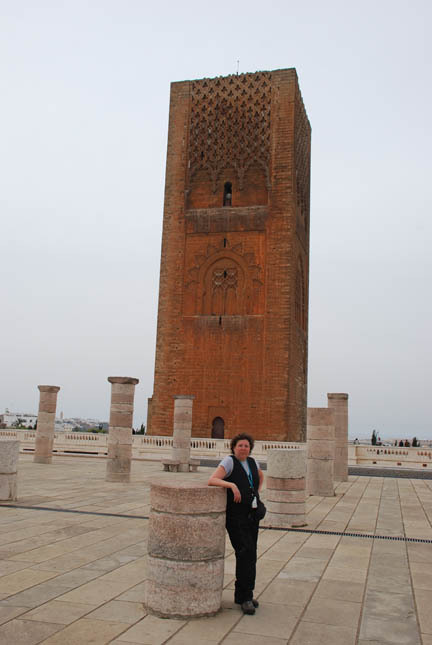 There are two main things to see in Rabat, Le Tour Hassan and the Mausoleum of Mohammed V.
Le Tour Hassan (The Tower of Hassan) was started in 1195 by sultan Yacoub al-Mansour and it was intended to 66 meters (over 200 feet) high. That would have made it the tallest in any Muslim world. But the sultan died four years after starting it and construction stopped. I guess the contract expired with him. It was only 44 meters (about 150 feet) high. It is still impressive. Attached to it was a large mosque. The mosque was destroyed in the earthquake the happened in 1755 (Lisbon, Portugal also suffered extensive damage from that quake). Today salvaged pillars have been stood in a marble plaza to represent the mosque area. It is amazing the tower survived undamaged. There are not even any cracks in it. 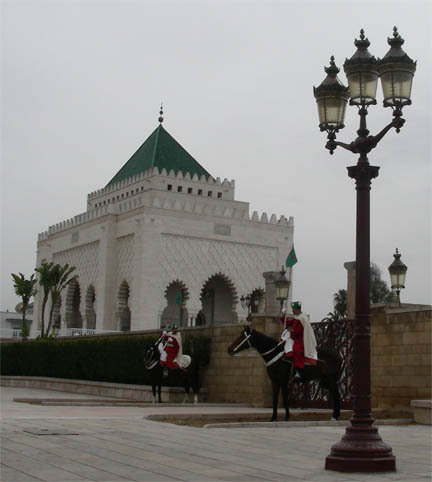 The Mausoleum of Mohammed V holds the bodies of the present King's grandfather (Mohammed V) and his father (Hassan II). But it was closed for two days to celebrate the kings. We saw no activity except a pressure washer cleaning the plaza. The ceremonial guards were splendid in their red and white uniforms and horses. From here we drove south down the coast to Mohammedia and found a campground. The next day we headed for Casablanca.